This article’s been a long time coming. And it’s not just for autistic people. When I wrote the growing up advice article, I wrote it while looking back at how I grew up. When I wrote the bullying article, I wrote it while looking back at when I was bullied. When I wrote the article on how I learned leadership skills, that was definitely looking back. IMPORTANT NOTE: this article is not called “how I beat anxiety”. It’s called “how I put anxiety in its place”. I make no claim to have “beaten” my anxiety forever, but I have done something I’m very proud of: I’ve turned my anxiety into something just tacked on to the side of my life, rather than something that permeates every aspect of it. Yes, a crude drawing. I don’t care. This progress, in some cases, is enough to save lives. Now I’m 30. I have a part-time job that I didn’t need two university degrees for (and currently doing a third), I live with my parents, I’ve been single for years and I’m in no financial position to move out. But, despite how I feel at this moment, I don’t think my self-worth has ever been higher. I have a much healthier self-perception these days. Beneath my anxieties, I love life deeply. When things get bad, I find distractions. I know which things are more likely to trigger my anxiety, so I avoid them. When life taught me lessons about anxiety, I kept them. I’m now in a place in life where I can play to my strengths. I actually talk to people about my problems. I’ll cover each one in detail later in the article. But a few things first. But when it’s the wrong kind of anxiety, oh bloody hell. I may keep the “pool of Legos” insult for future usage. At this Sunday’s church service, I learned that the cliché of feeling like you’re drowning is absolutely true. (And no, I was not being baptised for too long.) At first I thought it was because I was indoors with loads of people. But nope, the church building is enormous compared to the congregation it holds. I had to struggle outside, disguising my feelings as best I could, barging through the crowds of friendly people who kept stopping me and smiling and asking how I was getting on, unable to escape their friendliness without coming across as extremely rude, but needing- needing the fresh air outside and hoping that nobody else was just outside the church doors so I could literally gasp for breath. That’s what it feels like for me, anyway. Short version, of course. Depends on the person. Here’s a list of what triggered mine this week. Other people’s opinions of me. Powerlessness to change a situation I’m emotionally attached to. People I care about going through a rough time. The perception of someone being annoyed with me, regardless of whether they actually are. The fear of getting a negative response from someone, despite it not being a realistic possibility. The weight of moral responsibility to help people, but knowing I can’t. The ‘ping’ of receiving a new Facebook message from someone I’m in the middle of debating/arguing with. Your experience may differ. But the effects, I suspect, are the same. Does autism make you more likely to suffer with anxiety? Yes, but not the way you’re meant to think it does. When I give talks, I usually make the point that “autistic anger problems” are not necessarily caused by someone’s autism. Replace ‘anger’ with ‘anxiety’ and it’s just as true. It’s no secret that being on the autism spectrum often makes you susceptible to a range of mental health issues too. I’ve been told that 70% of people on the autism spectrum also have another condition too, and also that there are more autistic children with ADHD than without. And in the survey article from last week, 83% of almost 500 respondents said that they (or the autistic person they knew) had anxiety issues. But (not just in my opinion, but also in my experience), these anxiety issues are not always due to the hardwiring of your brain. I don’t believe I was genetically doomed to suffer from anxiety, and I showed no signs of it as a young child. But nonetheless, I ended up with it. Why? Because anxiety is a very typical response to growing up believing you’re wrong. My anxiety has nothing to do with my Asperger’s, as far as I can tell. My anxiety was because I felt like the odd one out for too many years, and too many people had implied that my style of ‘different’ was ‘wrong’. That, and the world seemed to have been designed with everybody else in mind. I felt like the unexpected guest at a dinner party who the hosts just try and fit in somewhere. At its worst, I felt like I was trespassing on the rest of the world’s property just by walking on it. So, short answer- yes, in several cases being on the autism spectrum makes you susceptible to other things too. But autistic people’s anxieties are not always “because of their autism”. Ok, I’ve read this far. Now tell me how you kill it. It may not work the way you think it does. It is true that the more you do something, the less afraid of it you are. But I feel obliged to warn you, don’t expect your fears to be absolutely annihilated. One of my biggest fears has always been speaking in front of big groups. These days I deliver autism talks, speak at the front of church once in a while, and for years I did it every day in front of classes. But I still get nervous before I talk to big groups. You know why? Like I said, I’ve never believed that anxiety is something you can ‘kill’. If your goal is to destroy every single inch of your anxiety, you can reduce your anxiety levels to lower than everyone else you know, and still feel like a failure. And that’s a feeling you won’t deserve. But you can put anxiety in its place. That is, most likely, the victory you need. This is taken from a story I wrote when I was 21. Before the anxiety struck its hardest, and before I knew I was autistic. Yes, this character was a brutally uncompromising one. But even back then, I knew her advice was true. With that in mind, here are each of the bullet points I mentioned earlier. 1. Have a healthy self-perception. In 2013, I believed I was a failure. Or, as I would have put it at the time, I “knew” I was a failure. This is a very dangerous opinion to have. Letting your weaknesses define you, and claiming any ‘knowledge’ that things cannot improve, are sure-fire ways of making sure they don’t improve. Seriously (and I’ve given this advice to plenty of people I love), don’t spend your life defining yourself by your weaknesses. Define yourself by your strengths. It’s part of human nature to see the bad things before the good (in fact, I’m wondering whether it’s an old survival instinct we’ve kept), but when your anxiety’s using your weaknesses to trick you into thinking you’re ‘worthless’, it’s time to remember what you’re good at. Oh, and if anyone reading this claims they’re ‘not good at anything’, they’re wrong. Find another person to help you find your strengths if you need to, but you definitely have strengths because you’re a human. 2. Have a deep-seated love of life. I know I said this before in 200 Things to Love About Life, but I’m saying it again. I haven’t talked about depression much in this article, but I was symptomatic of that too. And my biggest weapon against depression to this day is knowing that even if my own life isn’t going well, life itself is still beautiful. So I started picking out the very tiny things to love about life. Trees, the design of human hands, the sudden warmth when you enter a room… tiny, tiny but beautiful things. And the best thing about that? Now my anxiety’s less of a problem, I still get to enjoy all those beautiful things! Once in a while I’ll be awake in bed at 2am, really really not wanting to sleep because I’d be missing out on the sheer joy of being conscious. And I promise I’m not exaggerating. Find things to love about life. The rest will probably follow. 3. Find distractions when necessary. My usual reaction to a bout of anxiety is to go on Facebook and invite my friends round. They know me well enough to know that a mass Facebook invite is often the equivalent of me firing an emergency flare into the sky. While they’re here, we usually watch a film or play board games. It works a treat. If they’re unavailable, I write a story or play a strategy video game like Civilisation V. (Important note- do not let these video games become your life! It’s such an easy trap to fall into. And Civ V is famously one of those “just one more turn” games.) But whatever your interest is, find something that’s a total distraction from the thing you’re worrying about, and submerse yourself in it for just a little while. From Aspergers Reality (click picture for full-size). 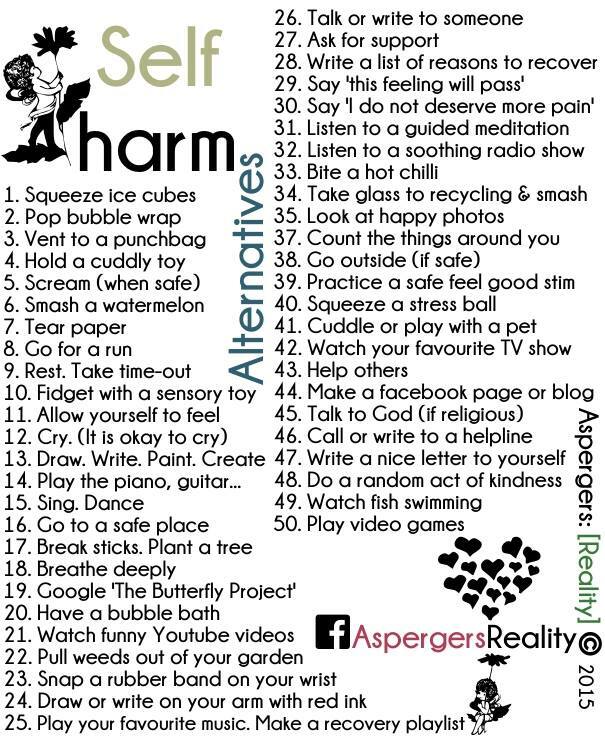 It may be about self-harm rather than anxiety, but it’s just too valuable not to share. 4. Know your anxiety triggers and avoid them. I’m not even sure how to elaborate on this. I think it really is that simple. Find out what stuff makes you anxious, and keep away from it unless you’re in the mood to handle it. 5. When bad times teach you lessons, keep them. I’m not a big fan of regretting things. I find it difficult to regret mistakes as long as I learn something from them. So, when I think about it, my regrets in life are little things such as bad chess moves- like blundering a queen in a winning position, and knowing that the only possible lesson is “don’t blunder your queen”, which I kind of knew already. The more ‘traditional’ regrets: allowing myself to be backstabbed by people I should have been able to trust, or going all-in on a teaching career only to leave less than a decade later, or swearing in front of Dad at the age of eight when the computer crashed: I don’t regret them in the way you’d expect. If it weren’t for those events, I’d still be ignorant to the motives of other people, mourning a career that never had a chance to happen, and thinking the ‘s’ word is just fine in casual conversation with my parents. So with that in mind, remember that life can teach you lessons about anxiety too. Keep them and use them to your advantage. Use your bad experiences to better yourself. 6. Find a place in life where you can play to your strengths. I can’t believe how often I give this advice. At every single talk I deliver, certainly. My anxiety was at its worst when I was supply teaching (or ‘substitute teaching’). Even though the schools I worked with were extremely supportive, all the support in the world could not shake the fact that every time I was in the classroom, I was teaching somebody else’s class using somebody else’s plan, which usually didn’t fit with my personality and my methods. At the time, I felt I had a choice between doing things their way, or doing things the wrong way. Therefore, my way must have been wrong. And, on top of that, I felt I was missing out on the sense of belonging that comes with working in a school full-time. And that’s nothing against the wonderful schools I worked in (who were extremely accommodating): it’s just the nature of the work I was doing. With my psychiatrist’s help, I identified that almost all of my anxiety issues came from the above (or at least were reinforced by it). So I made a decision: at the end of the school year, no matter what job I ended up getting, I was going to leave supply teaching forever. I can’t describe how much better I felt within a week. Even with no plan for the future! I left supply teaching and went on to work in a special school, then had my own class for one final term. Now I’ve left teaching altogether (and I left it on good terms too), I’ve got a non-strenuous job which allows me enough free time to concentrate on my other part-time job with autistic students, my public speaking, my Boys’ Brigade company, my masters degree in creative writing, and Autistic Not Weird. And now, for the first time in as far back as I can remember, I am finally in a place where I am playing to all my strengths, being the person I want to be, and dealing with the world (mostly) on my terms. Which is a little bit different to ‘knowing’ I was a failure two years ago. If you know I’m such a failure, please explain this lovely chess trophy I won at age 29. As I said earlier, a lot of people have a misunderstanding of bravery. So let me clarify. Bravery is not a lack of fear. Bravery is being afraid of something, but going through with it anyway. Again, I still get nervous when I speak in front of crowds. But I do it anyway. And these days it really is only ‘getting nervous’ rather than anything truly anxiety-related. This is because I’ve spent decades facing my fears (yes, I avoid the triggers, but not the fears themselves). You don’t overcome your fears by just avoiding them. If you ignore your fears at the age of 10, they’ll still be your fears at the age of 20. If you ignore them at the age of 20, they’ll still be your fears at the age of 30. And so on. The question is, how much of your life do you want to have these fears for? Easier said than done, I know. And it takes a lot of time to get it right. But it really says something that, right in the middle of my own weekend of darkness, I still believed this advice strongly enough to give it to a nervous teenager. I cannot express this one strongly enough. This is the other reason why I invite people over whenever I get anxious- it gives me more people to talk to, and more shoulders to lean on. This was also another reason why my therapy worked. I was talking to another person about what was going wrong, and that alone made me feel better. I basically did the complete opposite of this. And you know what? I’m going to practise what I preach. I, Chris Bonnello of Nottingham, former primary school teacher, Boys’ Brigade captain and owner of Autistic Not Weird, do hereby declare that I still suffer with unresolved anxiety issues reaching back several years. But I lead big groups of children anyway, I deliver talks on autism anyway, I’m loud and annoying at parties anyway, people value my advice anyway, and I’m told that I’m apparently a bloody good writer too. Yes, that last bit had hints of showing off. But anyone who’s spent far too many years with a low opinion of themselves has earned the right to show off about their good points. So anyone here with anxiety- show off to yourself. Find your awesome sides and recognise them for what they are. And, of course, the summary of main points. Distract yourself when things get bad. Avoid your triggers (but not your fears). Actually talk to people about your problems. All the best, guys. When I say “you’re better than you think you are”, honestly it’s not meaningless advice from this internet guy you’ve never met. I’m stating it as a fact, because everyone on Earth with anxiety is better than they’re often tricked into thinking! And incidentally, the anxiety bout I was suffering when I started this has now subsided. That’s what happens when you commit to fighting your demons, I guess. Oh, and now there’s more! Two years on from writing this article, an extra five tips have been written! Tips 9-13 are available to those who support me via Patreon (at the “bonus content” levels), as a thank you for helping me literally write for Autistic Not Weird as a job. If you’re one of those people, thanks so much for giving me the opportunities I have. terrific post – lots of great tips for dealing with anxiety ? As always, you are right on target with my experience. Having totally unrealistic expectations is my hurdle to playing to my strengths and my solution is not to just lower my expectations, but to build self respect by simply getting a little better at things that have defeated me and allowing myself to have off days when I back slide. Then I can get back on track again. But then I remember that we are not all dealt the same hand, we can only play the one we have, and no one knows how well we are doing that, but God. Nice comment- thank you. 🙂 I particularly need to remember the bit about allowing myself to have off-days- I’m not very good at that! One thing that works VERY well for me is exercise, because it makes my heart stop racing. Exercise!! Can’t believe that didn’t occur to me! Yes, it helps. 🙂 I hope everyone reads this comment. Great post, but I do have one minor issue. On #8, you say that one of the best ways to resolve anxiety is to talk to someone about it. While that’s certainly true, it’s something that I often have trouble with, largely because my pool of people to talk to is limited. There’s my family, of course, who are as helpful and supportive as I could possibly hope for, but they’re not always available to talk. Other than that, I have maybe one or two friends that I feel close enough to talk to about my personal issues, and again, they’re not always available. I imagine this is a problem that a lot of people with autism face, and I’m wondering if you have any suggestions. Hi- really sorry for taking so long to respond! It is a problem that lots of people face, autistic or not (in fact, anxious or not)- so yes, you’re certainly not alone. My first thought is that it’s great that you do have these supportive family members and friends. That’s certainly a great start. Also, do you know that they’re unavailable or is that just a feeling you get? Obviously I can’t know either way, but if you’re not literally asking already whether they have time to talk about your anxiety, you *might* find them more available than you first thought. I love this. So well written, so spot on target. Thank you for sharing your history with anxiety and how those bouts brought you to this understanding. Thank you for writing this article. I’ve been struggling with anxiety all my life, and your article has spoken to me more than any article I’ve ever searched for. I have started to personally face my fears before reading this article, and I think that what you have articulated will help me get through this difficult time. Haha, it wasn’t all supply teaching. 🙂 I was a class teacher, a teaching assistant, a special ed learning support assistant, a 1:1 tutor and a supply teacher at different times. And yes, sadly everything you said is true on the other side of the Earth too! A way to deal with anxiety. Live like no one’s watching! Error: Error validating access token: Session has expired on Saturday, 26-Jan-19 05:38:35 PST. The current time is Tuesday, 23-Apr-19 00:05:20 PDT.